From the field to the stars, Meade Instrument's 15x70 Astro Binocular offers the high magnification and light gathering ability to see small game far away or to discern craters on the moon. Utilizing a BAK4 Porro prism optical path provides a rich high-contrast depth of view while the large fully multicoated optics and objectives draw in a copious amount of light to produce bright and clear images. 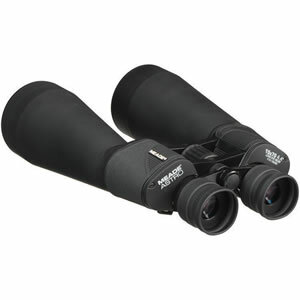 Whether you're bird watching or observing a meteor shower, the Astro binocular has the power and ability to see it all. Complementing the optical performance is a lightweight and durable aluminum alloy chassis with a rubber armored skin that offers protection against drops and impacts while providing a slip-resistant grip. A large knurled center focus wheel and right eye dioptric correction allows for a crisp tack-sharp focus ability, while fold-down runner eyecups allow the binocular to be comfortably used by most users with or without eye wear. Given the large objectives and 50oz weight, hand-holding the Astro Binocular for prolonged periods may prove challenging; so some may want to use an optional tripod adapter to mount them for long observation periods. Tripod mounting greatly reduces shake and fatigue so you can concentrate on the views.